My Mum made it sound like someone had died in the family, when in fact she was trying to calm the reaction she knew I’d give down before it happened. 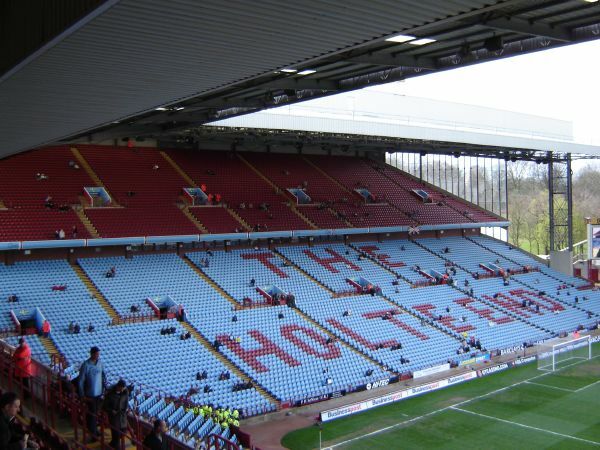 It was in the Holte End, Villa Park. The “North bank of the Midlands”. I didn’t care, I turned up in my Arsenal shirt (under a jacket that my old man made me stick on), gloves, hat and I sat there with thousands of Brummies as for the first time ever, I saw The Arsenal walk out live on to the pitch. “Whatever you do, don’t go mad when they score” the old man warned me. Within 10 minutes, Freddie scored and amazingly I kept my cool. But when Thierry Henry, my hero and idol from the age of 7 went through and smashed it past Sorensen for 2-0, I couldn’t do anything else but jump out of seat and scream (They weren’t going to attack an 11 year old.) My Dad eventually joined in with me, two southerners buzzing in the Holte End, facing the Gooners at the other end of the pitch. And after Cashley Cole scored what is still one of the best goals I’ve seen from the Arsenal, I was made up. I genuinely didn’t mind cheering Juan Pablo Angel’s late consolation. My day was complete, and I have been hooked on the drug that is watching the Arsenal ever since. Luckily, since then I’ve got in the right seat, whether that was for the final season at Highbury, the Emirates or a few away games. Me and my 17 year old brother head up there together a lot now, and people can say what they like about ticket prices, how its “wrong” and how “football has been ruined by money”. And in fairness the older fans are probably right. But for us younger lads, this is all we’ve known. And the thrill and adrenaline rush when The Arsenal hit the back of the net is like no other feeling in the world. Keep backing the lads, eventually they’ll get it right. And hopefully I’ll have a seat when the finally pick up that Premier League title. This entry was posted in Arsenal and Me and tagged Arsenal, Arsenal F.C. supporters, Arsenal FC, Brummie, Emirates Stadium, Premier League, She Wore A Yellow Ribbon, Thierry Henry, Villa Park on November 4, 2013 by keenosafc.